Jordan Rhodes has now scored nine goals in the Championship this season. 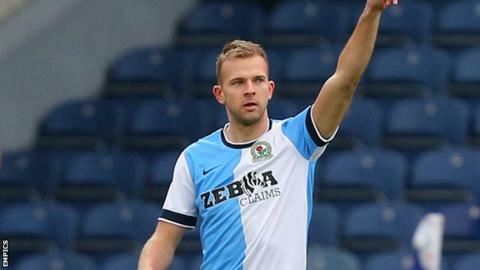 Jordan Rhodes netted a first-half brace to give Blackburn their first win in four and extend Charlton's winless run. Rhodes put the home side ahead with a right-footed shot after the ball broke to Ben Marshall, who provided the pass. The Scotland striker then doubled Rovers' lead with a simple tap-in after he outmuscled Tal Ben Haim. Andre Bikey had Charlton's best chance in the second half, but he sent his header over the bar and they are now without a win in five league games. The Addicks, who have only won two of their 12 away games in all competitions this season, slipped to 12th in the table, while Blackburn remained in eighth. The home side got off the mark in the sixth minute when Jordan Cousins was robbed by Shane Duffy and the ball fell to Marshall, who teed up Rhodes for a cool finish. Rudy Gestede's header created another opening for Rhodes, who got to the ball ahead of goalkeeper Nick Pope and poked in for the second. Unmarked Igor Vetokele could have pulled one back for the visitors before the interval, but the ball glanced off his head and went wide of the post. Boss Bob Peeters brought on Joe Pigott for Callum Harriott at the break and Charlton increased the pressure on the home team, but they rarely threatened to discomfort the Blackburn defence. The two teams will meet again on 3 January at The Valley in the third round of the FA Cup. "I'm delighted with the team. We had some negativity in the press this week with the Financial Fair Play and the fact we have lost two games on the trot. "You'd have thought we hadn't won for about 10 seasons the way some people were talking about us, but it made us stick together and come out fighting. "Our intensity in our game with and without the ball was magnificent. We never let Charlton settle and we were able to control the game." "I'm not happy at all and we started very badly. We know what they're all about, physical with a lot of presence in the box, but, if you give away the game in the first 15 minutes, you can't do anything about it. "We never felt like we were going to score. Our strength is normally our defence and defensive discipline, and that's what we lacked, especially in the first 20 minutes. "If you come up against experienced teams with a lot of presence and aggression, you struggle like we did." Match ends, Blackburn Rovers 2, Charlton Athletic 0. Second Half ends, Blackburn Rovers 2, Charlton Athletic 0. Offside, Charlton Athletic. Tal Ben Haim tries a through ball, but André Bikey is caught offside. Offside, Blackburn Rovers. Joshua King tries a through ball, but David Dunn is caught offside. Corner, Blackburn Rovers. Conceded by Joseph Gomez. Attempt blocked. Joshua King (Blackburn Rovers) right footed shot from the left side of the box is blocked. Assisted by David Dunn. Attempt saved. Joe Pigott (Charlton Athletic) right footed shot from outside the box is saved in the bottom right corner. Attempt missed. Igor Vetokele (Charlton Athletic) right footed shot from the left side of the box misses to the right. Assisted by Yoni Buyens. Foul by David Dunn (Blackburn Rovers). Yoni Buyens (Charlton Athletic) wins a free kick in the attacking half. Attempt missed. Ryan Tunnicliffe (Blackburn Rovers) left footed shot from outside the box misses to the left following a set piece situation. Attempt missed. Joshua King (Blackburn Rovers) right footed shot from the right side of the box is too high. Assisted by David Dunn. Attempt saved. Shane Duffy (Blackburn Rovers) header from the centre of the box is saved in the centre of the goal. Assisted by Ryan Tunnicliffe with a cross. Corner, Blackburn Rovers. Conceded by Nick Pope. Attempt saved. Ryan Tunnicliffe (Blackburn Rovers) right footed shot from outside the box is saved in the top right corner. Assisted by Alex Baptiste. Substitution, Blackburn Rovers. David Dunn replaces Ben Marshall. Substitution, Blackburn Rovers. Joshua King replaces Rudy Gestede. Attempt saved. Ben Marshall (Blackburn Rovers) left footed shot from the right side of the box is saved in the centre of the goal. Assisted by Rudy Gestede. Substitution, Charlton Athletic. Frédéric Bulot replaces Jordan Cousins. Attempt missed. André Bikey (Charlton Athletic) header from the centre of the box is just a bit too high. Assisted by Johann Berg Gudmundsson with a cross following a corner. Corner, Charlton Athletic. Conceded by Alex Baptiste. Corner, Blackburn Rovers. Conceded by Jordan Cousins. Shane Duffy (Blackburn Rovers) wins a free kick in the attacking half. Attempt missed. Igor Vetokele (Charlton Athletic) header from the centre of the box is close, but misses to the left. Assisted by Johann Berg Gudmundsson with a cross following a corner. Corner, Charlton Athletic. Conceded by Corry Evans. Attempt missed. Corry Evans (Blackburn Rovers) right footed shot from outside the box misses to the right following a set piece situation. Offside, Charlton Athletic. Yoni Buyens tries a through ball, but Igor Vetokele is caught offside. Joe Pigott (Charlton Athletic) wins a free kick on the right wing.